With all the turkey and football and colorful sweaters and even more turkey from the Thanksgiving holiday now in our rearview mirror, we can set our cheerful sights on Christmas, which is just around the corner. SeaWorld parks across the country are brimming with exciting, Christmas-themed shows and attractions for their very special ‘SeaWorld Christmas Celebration’. Bring the entire family to enjoy everything from Santa to Shamu®; SeaWorld’s Christmas Celebration is where holiday memories are made. Let the holiday spirit splash over you at SeaWorld this holiday season! And TicketsatWork.com has all the best deals to experience the wintery, watery wonderland SeaWorld has designed for everyone to enjoy during the holidays. SeaWorld® invites you to experience the power and beauty of our Shamu family in a nighttime holiday show: Shamu® Christmas Miracles. Thrilling seasonal music rings out and killer whales soar through the air in a story of reflection and understanding. Hear the greatest story never told with over 30 carols, live-size puppets and live animals in the brand new show that will charm, entertain and delight people from all walks of life. The beloved holiday classic comes to life as you and your family are wrapped up in the heart-warming story of a young boy’s thrilling ride into an enchanted world. The sights, sounds, and scents of the season surround you. Christmas comes to life on a stage of ice, jewels and light as skaters dazzle and delight in this show-stopping, ice skating extravaganza. Take a walk through a wintry, watery wonderland and get immersed in a sea of holiday trees. Save On Single Day Admission! Christmas Celebration Included! Save Up To 35% And Receive The 2nd Day Free! Christmas Celebration Included! 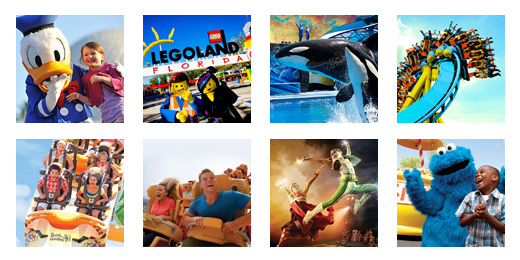 Save Over 55% on a Single Day Ticket! A Very Furry Christmas at Sesame Place® is a festive, family-friendly celebration with everyone’s favorite Sesame Street® friends. Save up to 30% on A Very Furry Christmas with 2nd Day Free! Celebrate the spirit of the season at Busch Gardens® Christmas Town™. Save over 35% on Christmas Town! Tis the season to celebrate with SeaWorld!